non-fluid contacting structurally rigid frame constructed from polypropylene and KYNAR®. overlapping flow ranges are available for water from 5 mLPM (0.00132 GPM) to 45 LPM (12 GPM). 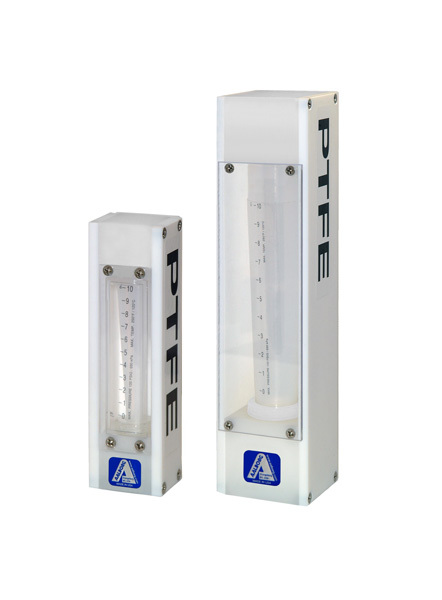 Incorporating the principles of traditional rotameter flow technology, these rugged PTFE-PFA flow meters offer solutions to low to medium flow range measurements of highly corrosive or ultra-pure liquids. Model L Meters are constructed of inert materials such as PFA, PTFE and PCTFE. Wetted inert components are surrounded by structurally rigid materials such as polypropylene, KYNAR® . The resultant design represents a unique combination of a rugged mechanically rigid frame and the chemically inert wetted parts. Flow meters are also resistant to external, ambient corrosives. For the protection of personnel each flow meter is supplied with a safety shield. Flow meters are supplied with or without built-in needle valves and they are panel mountable, by means of KYNAR® panel nuts. 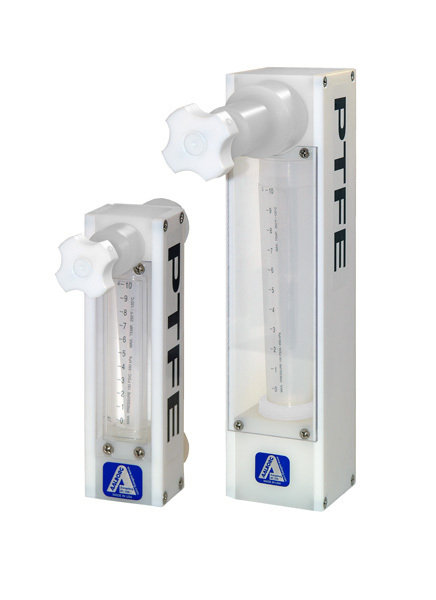 A cylindrical float freely moving inside a tapered flow tube comprises the flow measurement element of PTFE - PFA flow meters. The translucent PFA flow tube is installed vertically in-line in the liquid stream. As flow takes place the float is propelled up inside the flow tube. The area between the float and the inside diameter of the flow tube gradually increases with increasing flow and correspondingly the pressure lifting the float decreases until the weight of the float and its buoyant force come to equilibrium. At equilibrium the top of the float is lined up with a scale graduation on the flow tube denoting a discrete rate of flow.